As part of our home schooling each year, we make dragon bread for Michaelmas, decorating the monster with dried fruit and nuts. We like to use pumpkin seeds for spikes! Michaelmas is celebrated in honor of Saint Michael, who was known to have slain a fierce and daunting dragon. Because of this, Michael is honored as a pillar of strength and courage. Michaelmas is also often celebrated in conjunction with the fall equinox. Michaelmas helps us to bring forth our own bravery to prepare our inner selves for the long, dark and cold winter months to come. 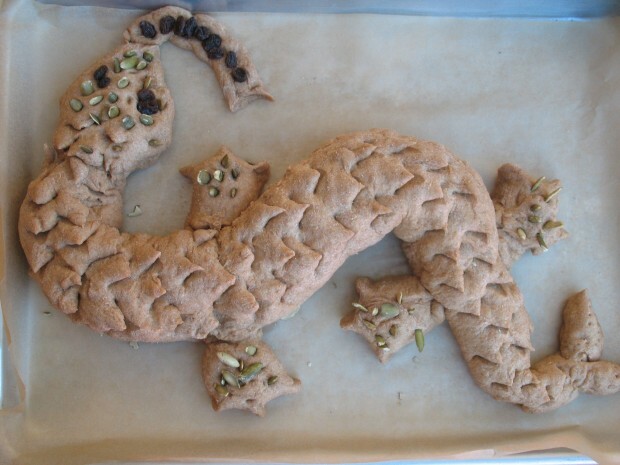 For our dragon bread, we molded and shaped the dough into a dragon, cooked that beast, and happily ate him right up. And his spikes didn’t even hurt going down!